Between January 2009 and July 2016, 11 wonderful women were able to take advantage of our apprenticeship program. You can read below what they say about the opportunity of an extended amount of time with our looms and textiles. Every one of these women has become an accomplished weaver and a valued friend. If you long for the opportunity to study weaving at Vävstuga for an extended period of time and receive an excellent weaving education in the Swedish tradition, our Väv Immersion program could be a good fit for you. There are some financial aid opportunities for applicants 18–35 years of age. My dad was the one who suggested I take a weaving elective in high school. 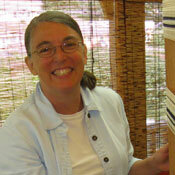 I had my first weaving class in 10th grade and fell in love with the looms, fibers, and patterns. Since then I have bought a floor loom and table loom. 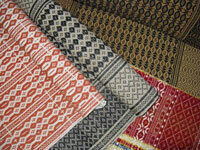 I mostly weave rag rugs but continually thirst for more: more designs, different fibers, bigger looms, more equipment... I can't get enough. I have a passion for weaving and I'm excited to pursue this craft that I've kept on the back burner for 8 years. Through this apprenticeship I am looking forward to being immersed in the fibers, looms, "shop talk," patterns, and books. I know mistakes will occur along the way, but I couldn't be at a better place to learn how to fix them! I struggled to teach myself how to weave, but Becky's Vävstuga Basics class taught me more than all three years of my weaving experience combined. I am eager for the technique and skill that my apprenticeship will instill. I count myself fortunate to be able to follow the footsteps of the many talented apprentices who have gone before. I am so thrilled to be at Vävstuga and I am looking forward to living and learning in this beautiful space and generous community in the months to come. As the daughter of an artist, my young adult rebellion was to turn away from the arts, and my arrival at Vävstuga as an apprentice is the culmination of a long meandering journey back into the fold. 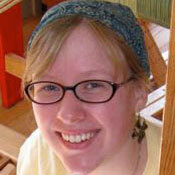 After ditching my arts eduction, I took up knitting, which sustained me creatively through college, graduate school, and a (short) professional career. As time went on I began to obsess over old styles and techniques, which led me to collect vintage knitting magazines and to study textile history. Gradually, I expanded beyond the realm of hobbyist knitter, added spinning and weaving to my repertoire, and drifted into the world of fiber arts. I had been searching for a way to go further with weaving (which is to say, beyond object-making on DIY looms) when in March of 2014 the stars aligned to bring me to Vävstuga as a student. Within 24 hours I knew this was my community. Luckily for me, it also gave me a reason to continue studying Swedish! Since I arrived at the studio in early January I have already learned so much. It's truly a privilege to be here. Many years ago I fell in love with the opportunities that came through building fabric line by line. But it wasn't until this past summer when I took the Basics class at Vävstuga that this passion was reignited and that I more thoroughly began to understand the subtleties of the process and how it was a metaphor and framework to understanding more than just weaving. My goal as an apprentice has been to develop a strong foundation that will allow me to take any project from start to finish, and that will give me a platform for moving more deeply into creative processes that are impromptu on the loom. Weaving is a meditative process, as well as a technical and creative one, and I am looking forward to the opportunity to see how these traditional hand skills will feed and nurture all of the areas of my life far into the future. What an education my apprenticeship was! I wound miles of warps and wove everything from fine Swedish table linens to coverlets. 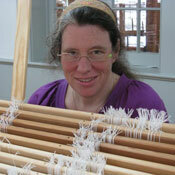 I learned to change my loom to meet my needs and to "think like a thread." Every day I used handwoven linens and studied the structure of the weavings surrounding me. 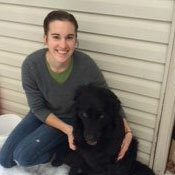 Becky guided me on the journey, providing challenge at the right moment and joyfully sharing her wisdom. But she also knew when to let me struggle so I would learn for myself. Susan, Kim, Linda, Celeste, past apprentices, and students all added to the fun and learning. After a most wonderful six months, I left a fearless weaver. Now a day isn't complete if I haven't woven. As a very new weaver, I still can't believe how far my weaving skills have progressed in such a short time. The last six months at Vävstuga were an absolute whirlwind of weaving knowledge. I am now comfortable with complex weave structures and the looms. Working with Becky and Susan was an amazing experience; one that I am so glad that I was able to take advantage and learn so much in such a short period of time. I am looking forward to a lifetime of weaving! The better part of six months flew by while I learned and played in the Vävstuga vortex. Becky and Susan were fantastic to work with and I couldn't have found a lovelier, more pleasant community than Shelburne Falls. I continue to be amazed at the beautiful items I created in such a short time, that represent so many techniques, skills, and materials that I had never before used. When I first attended Vävstuga for the Basics class in November 2011, I returned home saying I wanted to live a handwoven life. Now, after nearly six months of immersion at Vävstuga, I am well on my way. I enjoyed a fabulous six months as an apprentice at Vävstuga. I can make my mistakes with confidence and can use the tools I have learned to find a way to fix them. 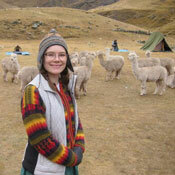 The apprenticeship was all about setting the bar high but being human enough to enjoy the journey of weaving. Yes, there were plenty of learning opportunities along the way. Becky and Susan mentored me to enjoy the art, have fun, and there was no mistake big enough that a few cookies couldn't remedy. Thank you! My initial goals for my apprenticeship were to live a weaving lifestyle and complete my apprenticeship projects, living room curtains and a torpa table runner. Now that I've completed my apprenticeship, I reflect on how my goals have changed. I went from being a true beginning weaver to a novice, because I now have confidence and a solid frame of reference for the complete weaving process. Through assisting with the three Basics classes and working in Vävstuga's store, I understand more of the concerns and language of beginning weavers. 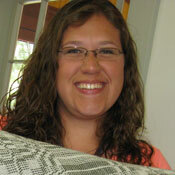 I know how to ask for help, and seek advice from experienced weavers to solve problems. I'm more flexible in thinking about the design process, from idea to profile draft to a threading draw down and options that are available to modify that first attempt. I have specific product goals that I want to accomplish which are more than just turning out yardage or projects. I've learned that I need to be a part of a focused community of weavers, because those relationships are a part of what makes this artistic journey worthwhile. I am deeply grateful for the friendship and lessons that Becky and Susan taught me, as well as for the wonderful fellow weavers whom I met as students and customers at Vävstuga. In order to pay it forward, I want to give back to this wonderful school. I want to be a resource for future apprentices. Please feel free to email me at . 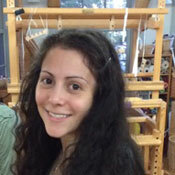 Lisa Maria Bertoldi, 26-year resident of Williamsburg Massachusetts, has a background in environmental education that informs her involvement in the world of textiles. 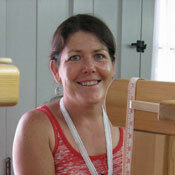 Since her apprenticeship, Lisa has continued to weave, specializing in kitchen toweling with a weft of her handspun linen thread. 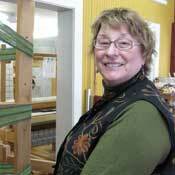 She now co-chairs the Massachusetts Sheep and Woolcraft Fair, a fair with more than 40 years of history. 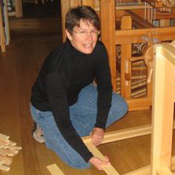 She is part of New England Flax and Linen Study Group and is planning the two-day symposium on the subject, called Flax and Linen: Following the Thread from Past to Present. She chairs the Vävstuga Scholarship Committee. As a soon-to-be high school graduate in early 2008, I was having some difficulty deciding on my next step. I knew I would not be ready to head off to college immediately, but I also felt a strong need to be actively doing and learning... something. The solution presented itself when I took the Vävstuga Basics class. I fell in love with the yarn, looms, people, and environment and was thrilled to learn about the possibility of an internship. 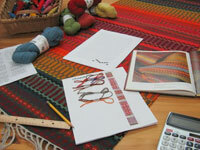 A year later I found myself as the new apprentice, embarking on a six-month weaving adventure! 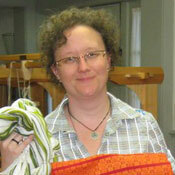 It was not all fun and games, as I worked hard for my weaving and instruction privileges, but it was well worth it. I learned so, so much and truly enjoyed being immersed in the colors, sounds, and smells of this amazing school. It was difficult to leave when my time ended, but as I look ahead at the upcoming year I am thrilled to see the opportunities that have opened up to me as a result of my time at Vävstuga. I am proud to be following in the footsteps of Becky Ashenden as I head off (late summer 2011) to spend a year studying weaving at her alma mater, Sätergläntan, located in Dalarna, Sweden. Once my studies there are completed, I anticipate many joyous years of weaving and teaching -- the passion for which I never would have discovered without the skillful mentorship I experienced during my time at Vävstuga.